Wild Rice and Mushroom Soup is such a wholesome dish. It tastes warm, rich, and creamy and is a perfect meal on its own or side with a sandwich or salad. John is generally a meat and potatoes kind of guy. When we married a few years ago (actually over 35 years), he wasn’t very adventurous. Wild Rice and Mushroom Soup sure wasn’t on his radar. Once in a while, John has to go out of town on business. 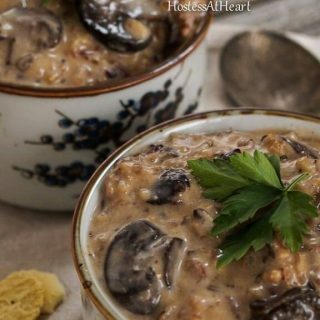 I always miss my honey bunny, but take advantage of the time to cook up dishes that he wouldn’t have much to do with like this Wild Rice and Mushroom soup recipe. I am very glad that I did. This soup is hearty and so flavorful. John got home and we enjoyed a big bowl for lunch. He loved it and said that it was so delicious that he didn’t even miss the chicken. Yee Haw! 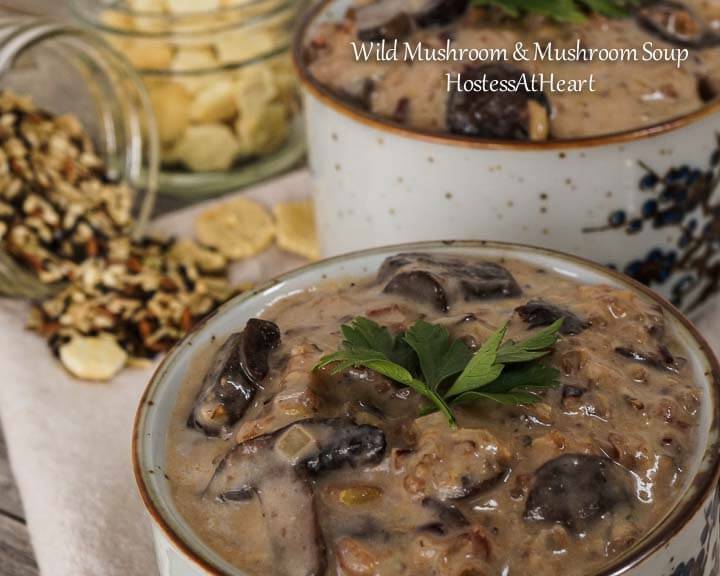 Homerun for the Mrs.
Wild Rice and Mushroom Soup is such a wholesome dish. It tastes warm, rich, and creamy and is a perfect meal on it's own or side with a sandwich or salad. Preheat oven to 375° F. Grind shiitake mushrooms in a spice grinder until finely ground (you should have about 3 tablespoons). Bring water, thyme, bay leaf, garlic clove, 3/4 teaspoon salt, and baking soda to boil in a medium saucepan over medium heat. Add rice and return to a boil. Cover saucepan, transfer to oven, and bake until rice is tender, 35 to 50 minutes. Strain rice through a fine-mesh strainer set in a 4-cup liquid measuring cup; discard thyme, bay leaf, and garlic. Add enough water to reserved cooking liquid to measure 3 cups. Melt butter in Dutch oven over high heat. Add cremini mushrooms, onion, minced garlic, tomato paste, 3/4 teaspoon salt, and 1 teaspoon pepper. Cook stirring occasionally, until vegetables are browned and dark fond develops on bottom of pot, 15 minutes. Add sherry, scraping up any browned bits, and cook until reduced and pot is almost dry, about 2 minutes. Add ground shiitake mushrooms, reserved rice cooking liquid, chicken broth, and soy sauce and bring to boil. Reduce heat to low and simmer, covered, until onion and mushroom are tender, about 20 minutes. 4. Whisk cornstarch and remaining 1/4 cup water in small bowl. Stir cornstarch slurry into soup, return to simmer, and cook until thickened, about 2 minutes. Remove pot from heat and stir in cooked rice, cream, chives, and lemon zest. Cover and let stand for 20 minutes. Season with salt and pepper to taste. I think I would rather give up meat than mushrooms. They have such a wholesome earthy flavor and are like little flavor sponges. I specifically love cremini (baby portabellas), shiitakes and some of the exotic blends. One thing I have to pass along is that 1 teaspoon of lemon zest doesn’t sound like much, but it makes such a big difference in this soup. Don’t leave it out. Well, in all fairness, John has really expanded his horizons in the years that we have spent together. He knows if I say he’ll like something he generally will. There are still some things off the table, but we have time. Hopefully another 35? Post language updated 11/2/16. No recipe changes made. Your soup sounds delicious. When my husband has been out of town, I too often make soup but I know he wouldn’t want to miss savoring some of this one. Thank you Karen! It’s one of our favorites too. This soup is loaded with ingredients ! wow! Thank you Liz! It is one of my favorite soups. The soup is spectacular Julie, I love mushroom soup and LOVE that you added the wild rice. Thank you so much for bringing to the party. Thank you Suzanne! Thank you for cohosting this week! My mouth is watering! I adore all kinds of mushrooms and soup is always on the menu here – even in summer! – so I must try this. Delish. Thank you so much! I’m with you, I love all kinds of mushrooms! Looks wonderfully warming and comforting! Thank you Caroline. I swear I could eat mushrooms at every meal. A delicious and filling soup for a cool evening. Thank you Karen! I am really getting into the soup mode with the cooler days. Yay, soup season! I am not a huge mushroom fan, but I can eat them in soup. This looks delicious Julie! Thank you so much, Antonia! I love them but it seems like there are just as many that don’t. Like you, I just LOVE soup. Thank you! It is just that good Sarah. I might try it again some day with chicken, but it doesn’t need it. 35 years! wow! speaking of wow this soup looks so hearty and delicious I can’t imagine anyone not loving it! Thank you so much Sarah! We really enjoyed this soup and I’ll be repeating it regularly. That 35 years has just flown by. Wish time would slow a bit! Thanks Josette! I just can’t imagine anyone not liking them. Looks so good and comforting! I usually make mushroom soup from chantarelles as we pick them from our nordic forests! You are very lucky to get fresh chantarelles! I have to rely on what our grocers carry. We do get morel mushrooms but I don’t care much for them. Thank you for visiting! Che delizia!! This looks ever so delicious, you are a good cook! I could get on board with this one. Looks great! After you dropped me such a nice line, I just had to pop over to check out your blog. What beautiful posts you have. This is a perfect recipe for these grey days we are having here! I am so happy that you stopped by, and I appreciate the follow! I will be sure to do the same and look forward to those yummy recipes too! Thank you so much. I hope for 35 more. We will definitely make this soup again! Can you believe I do not like mushrooms? Nothing better than a homemade soup though 🙂 Gene and I were together 34 years before he passed away way to soon. I’m so sorry to hear that Judi. I know how fortunate we are. 90 years isn’t long enough for me. I like being home alone so I can just cook for me too – I’d choose this soup any day. I love mushrooms, too–this sounds like a great soup! And I bet the lemon zest gives it a nice punch! This looks fantastic. 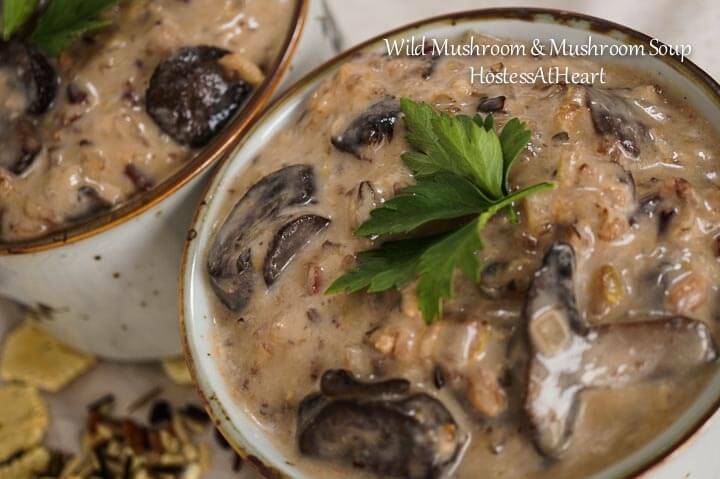 I just posted a cream of mushroom soup but I bet the addition of wild rice makes it all the better. Yum! Thank you Jamie! I have a wild rice blend that I get in the organic section of our store that I really love. It’s a great source of grains and fiber. Wonderful soup Julie, hearty and earthy, Sounds delicious. It was yummy. I just love soup and eat it year around. This soup sounds very flavorful and looks delicious, Julie! It looks so hearty – I can see why the chicken wasn’t missed. I’m pinning this one to make soon…and I won’t skip the lemon zest! Thanks Nancy! It was soooo good. I am missing it already. This looks delicious! Only – 1/2 what of heavy cream? 1/2 c? oh and p.s. PicMonkey is a free editing tool. The WP folks also told me how to do the text on pictures with my Mac, I’ll have to give it a try. I used PicMonkey too. It is a great program. Thanks for the tips! Yea Loretta! What month is your anniversary? [email protected]. I would love to hear from you Loretta!